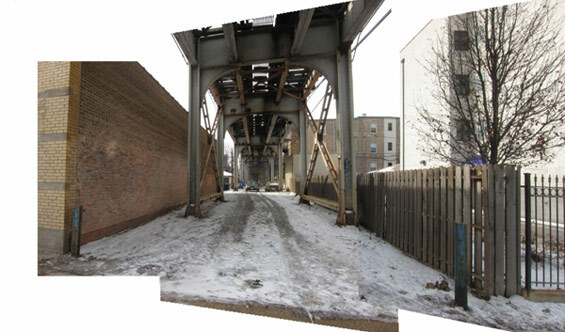 moss was commissioned to formulate the LAMP (Lakeview Area Master Plan) by the The Lakeview Chamber of Commerce to pro-actively plan for business, economic development, and sustainability initiatives in the Lakeview neighborhood of Chicago, Illinois. The plan creates a hub for urban scale sustainable design innovation and improvements while enhancing the pedestrian environment, strengthening business opportunities, and mending the urban ecosystem. 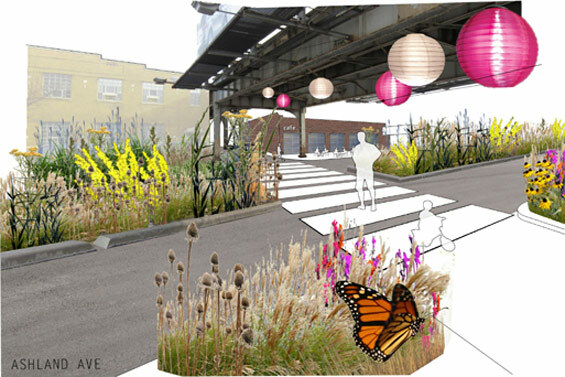 The “Low-Line” is a proposed, green walking path beneath the El tracks between the Southport Avenue and Paulina Avenue stations. 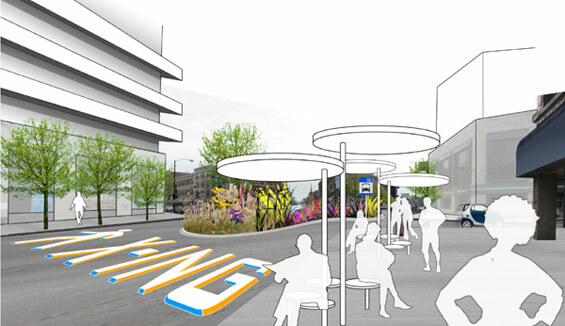 The path is enhanced by decorative lighting and native landscaping elements, and will directly connect the Southport Avenue and Lincoln Avenue shopping districts. The Chamber has engaged the Chicago Transit Authority (CTA) and local residents to develop and refine the strategy, which will become a unique asset to the community. The 6-point intersections on Lincoln Avenue are an obstacle to easy pedestrian crossings to access both sides of the shopping street. 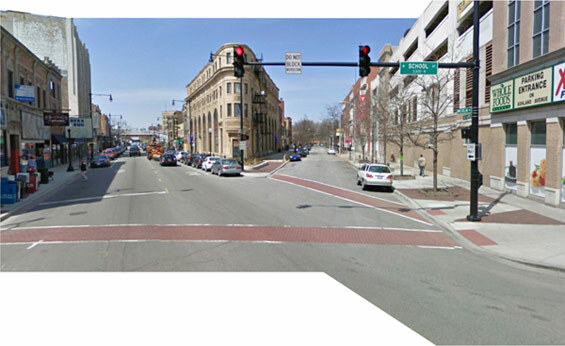 Others, namely the Lincoln-Ashland-Belmont (LAB) intersection, are extremely dangerous to pedestrians. To provide for more comfortable pedestrian environments, the plan advocates for sidewalk and crosswalk enhancements that feature a traffic ‘bean’, or elongated round-about. 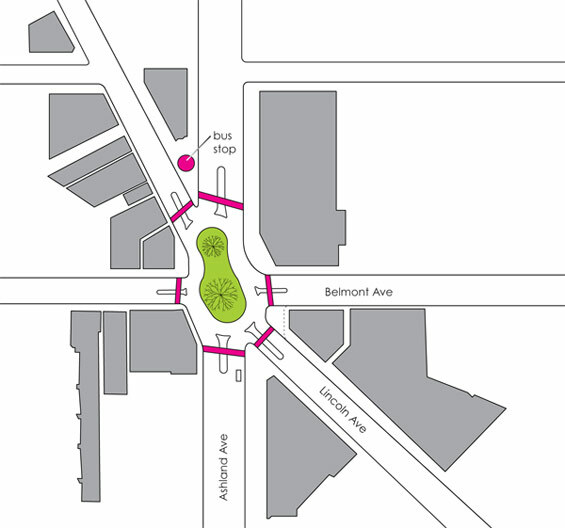 The redesign of the Lincoln-Ashland-Belmont (LAB) intersection will include rain gardens and pervious surfaces. A viable remedy to alleviate the City of Chicago’s overtaxed stormwater system is to increase pervious surfaces throughout the City. Rain gardens, planted with drought tolerant, native landscaping would be installed in street medians (such as Ashland Avenue) or between the curb and building façades. In addition to stormwater capture, native landscaping and rain gardens may also increase wildlife diversity. Healthy eco-systems house and support diversity with an array of flora and fauna. All available urban open space areas and available rooftop space will incorporate an assortment of plant species to attract urban wildlife, such as butterflies, hummingbirds, bees, caterpillars and dragonflies. A wide variety of wildlife and landscaping allows for a balanced environment capable of weathering the ebb and flow of the urban eco-system. Urban wildlife also facilitates pollination of urban gardens and farms. 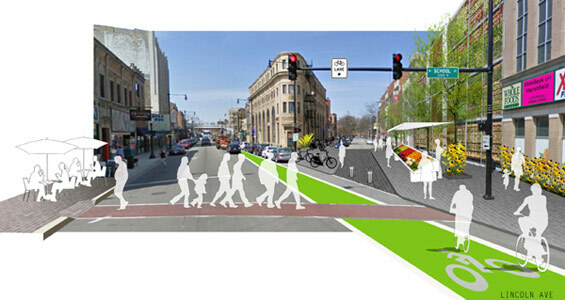 Lakeview will embrace and provide for varied forms of sustainable mobility, especially bicycle transit. Bicycle usage reduces automobile dependence for local residents, thus providing more available on-street parking for potential district shoppers. An accommodating biking environment will attract Chicago’s cycling community to the district, which will attract bike-related businesses to the area. Strategic addition of dedicated and shared bike lanes will help to connect Lakeview to Chicago’s overall bike route network. The plan provides for improvements to pedestrian and bicycle infrastructure, including covered bike parking, enhanced bike lanes and advocacy for bike sharing. 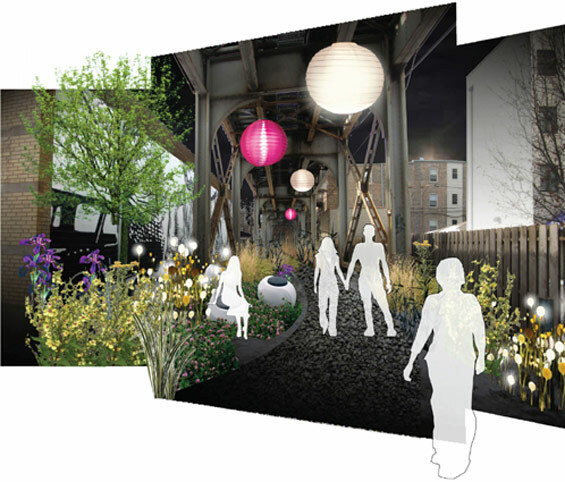 Since the release of the master plan, moss has been commissioned to develop the design of the LowLine portion of the plan.